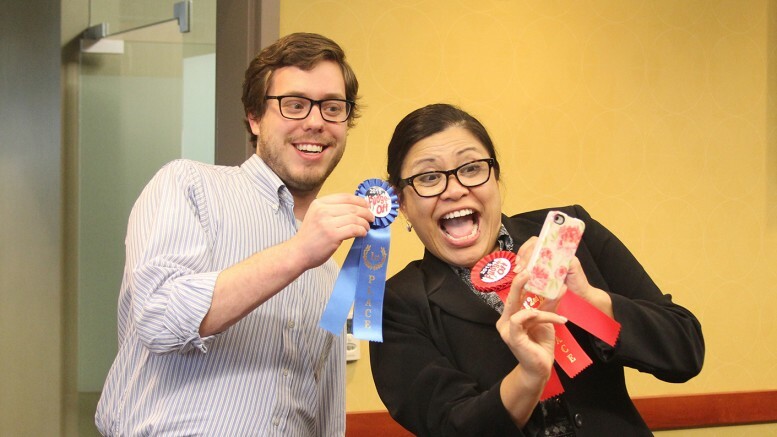 Andrew Bradshaw and Lorene Pagcaliwagan take selfies with their ribbons on Monday, after the judges determined who makes the best fudge. Photo by Hannah Haggerty. Lorene Pagcaliwagan, associate professor of French and Spanish, and Andrew Bradshaw, academic advisor, faced off in a friendly competition to determine who makes the best fudge. 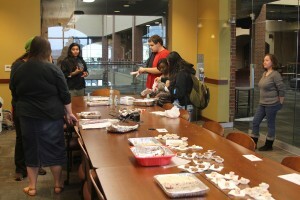 Students taste tested the variations of fudge during the competition that took place in the Tucker Student Center. 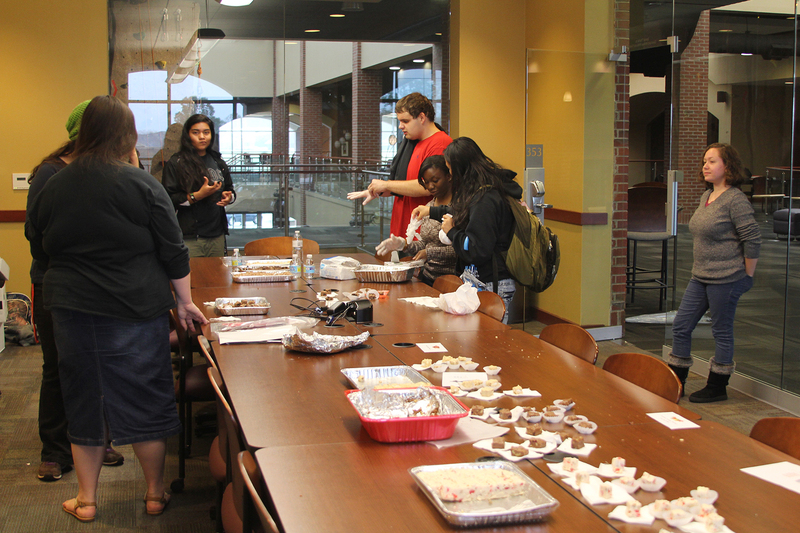 The competition was held in the Tucker Student Center on Nov. 9 where each contestant created three batches of fudge for faculty and students to judge. The desserts were white house cherry, mint, bacon, southern butter pecan and cranberries with walnuts. There were two rounds of voting. The first round of voting was by Delores Hunt, vice president of student development; Brad Vaughn, office manager for student activities, Shea Stuart, assistant professor of English and Charlie Eudy, a freshman student. A rubric was given to the voters to determine the quality of each batch of fudge including texture, taste, appearance and over-all product. Money raised during the fudge competition went to support Charlee Rae as she undergoes treatment for a rare genetic disorder. The second round of voting was through popular vote. Pagcaliwagan and Bradshaw labeled six jars that corresponded with the fudge flavors and the tasters voted by putting money in their favorite jar. All proceeds went to support Charlee Rae, daughter of American Sign Language professor Russ Gribble, as she undergoes treatment for Mucopolysaccharidosis Type I, a progressive genetic disorder that prevents the breakdown of excess materials in the body. More than 30 students attended the fudge competition, in much to the surprise of both of the competitors who only advertised the event one day to faculty and a class. The final decision was technically inconclusive. The four judges voted Bradshaw’s southern butter pecan as their favorite, but the popular vote was won by Pagcaliwagan’s I-Mint-To-Tell-You-It’s-Fudge. Pagcaliwagan’s mint fudge won by 10 dollars more than the second place popular vote. 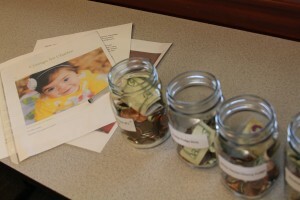 The donations at the event amounted to collected amounted to $63.32. Be the first to comment on "Fudge competition raises money for Charlee Rae"